This well designed yoga block is one of a kind and a great alternative to a lot of the toxic yoga products that are on the market today. * Earth friendly yoga block. GROWN AND MANUFACTURED IN THE UNITED STATES. 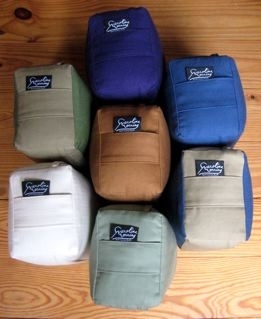 * RIGID for supporting the standard yoga positions, yet soft enough to be used as a sitting cushion or bolster for back stretches. * It is soft to the touch, breathable and washable--includes a zippered removable cover. * A tiny handle on one end helps make it easier to handle. * This is an alternative to the cork and bamboo (made in China) yoga blocks which are imported, thus adding to the environmental burden. * Be the first on your BLOCK to try it out! Colors going clockwise from the top: Purple, Indigo, Pecan w/ Indigo, Sage, Undyed Natural, Pecan w/ Moss, and in the center is Cinnamon.